When the outer hard tissues of the tooth are cracked, the chewing can cause movement of the pieces, and the pulp can become irritated. When biting pressure is released, the crack can close quickly, resulting in a momentary, sharp pain. Irritation of the dental pulp can be repeated many times by chewing. Eventually, the pulp will become damaged to the point that it can no longer heal itself. The tooth will not only hurt when chewing but may also become sensitive to temperature extremes. In time, a cracked tooth may begin to hurt all by itself. 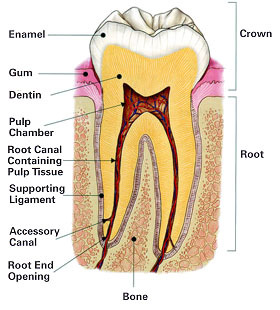 Extensive cracks can lead to infection of the pulp tissue, which can spread to the bone and gum tissue surrounding the tooth. Craze lines: Craze lines are tiny cracks that affect only the outer enamel. These cracks are extremely common in adult teeth. Craze lines are very shallow, cause no pain, and are of no concern beyond appearances. Fractured Cusp: When a cusp (the pointed part of the chewing surface) becomes weakened, a fracture sometimes results. The weakened cusp may break off by itself or may have to be removed by the dentist. When this happens, the pain will usually be relieved. A fractured cusp rarely damages the pulp, so root canal treatment is seldom needed. The tooth will usually be restored by your dentist with a full crown. Cracked Tooth: When a cusp (the pointed part of the chewing surface) becomes weakened, a fracture sometimes results. The weakened cusp may break off by itself or may have to be removed by the dentist. When this happens, the pain will usually be relieved. A fractured cusp rarely damages the pulp, so root canal treatment is seldom needed. The tooth will usually be restored by your dentist with a full crown. Split Tooth: A split tooth is often the result of the long term progression of a cracked tooth. The split tooth is identified by a crack with distinct segments that can be separated. A split tooth can never be saved intact. 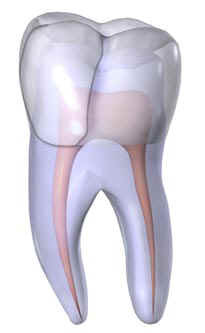 The position and extent of the crack, however, will determine whether any portion of the tooth can be saved. In rare instances, endodontic treatment and a crown or other restoration by your dentist may be used to save a portion of the tooth. Vertical Root Fracture: Vertical root fractures are cracks that begin in the root of the tooth and extend toward the chewing surface. They often show minimal signs and symptoms and may therefore go unnoticed for some time. 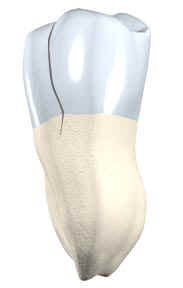 Vertical root fractures are often discovered when the surrounding bone and gum become infected. 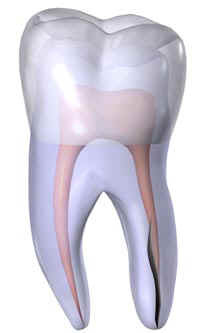 Treatment usually involves extraction of the tooth. However, endodontic surgery is sometimes appropriate if a portion of the tooth can be saved by removal of the fractures root.